These coyote bags are made with real coyote fur and, in some cases, deerskin or cowsplit leather. See below for available styles. 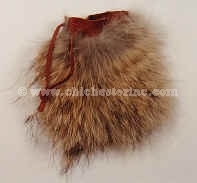 The Coyote Face and Tail Bag is an 8" x 8" (20 cm x 20 cm) bag with coyote fur on the front of a deerskin bag. It has a coyote face flap and tail and an adjustable 36" (91 cm) shoulder strap.